Condensation is distinct from other forms of dampness, such as rain penetration and rising damp. It is water released when air is cooled to its dewpoint temperature and unable to carry so much moisture as vapour – the opposite process to evaporation. This may occur indoors when warm, damp air comes into contact with colder building components. It may lead to mould and timber decay. However, a few simple measures can often successfully reinstate the delicate moisture balance in your home to prevent condensation. 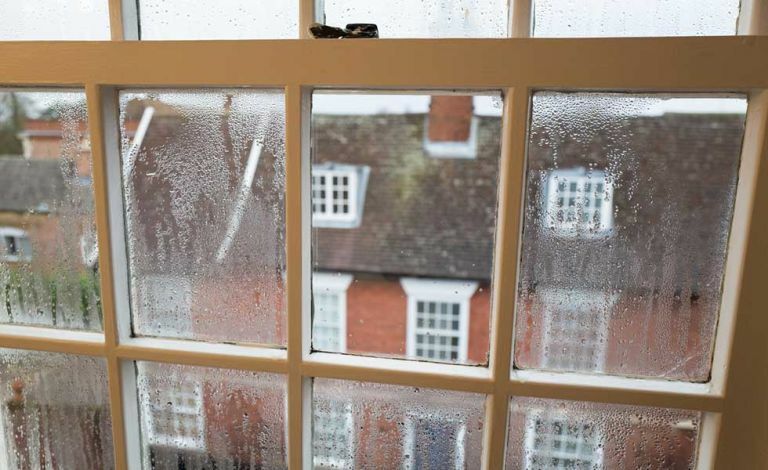 Douglas Kent, technical and research director for the Society for the Protection of Ancient Buildings (SPAB), gives us his expert guidance and insights on the causes of condensation in houses and how to avoid them. Find out more about renovating a house – or cleaning – on our dedicated pages. Period Living is the UK's best-selling period homes magazine. For a limited time, save over 80% and receive 5 issues for just £5 with a subscription. Condensation can arise when more moisture is produced – often from cooking or washing. Insufficient ventilation is another cause, for example, due to double-glazing, blocking of flues and air bricks, or incorrect installation of roofing underlay. Condensation occurs mostly in winter and might first be noticed when water droplets form on hard surfaces, or mould appears on absorbent finishes. What is known as ‘interstitial’ condensation occurs within the building materials and elements. For example, if a wall is covered with an impermeable barrier or renders that doesn’t allow moisture to pass through the wall naturally. If the condensation problem you have seems to be more than one you can solve by trying the methods below, it will be worth employing an independent chartered surveyor or consultant (not a contractor with a vested commercial interest); they can carry out a more detailed investigation if required. In domestic buildings, simple lifestyle changes that lower humidity and/or keep surface temperatures above dewpoint generally provide a more practical and less expensive long-term solution than dehumidifiers or whole-house ventilation systems. Try these ploys below, but opt for a dehumidifier if none works effectively. Vent tumble driers to the outside if not of the condenser type. Use our buyer's guide to reduce condensation in your home by finding the best dehumidifier. Ensure that lofts, floor voids and redundant chimneys are well ventilated and avoid foam treatments on the underside of roofs that can cause timber decay. Increased heating can maintain surfaces above dewpoint, especially if run constantly at a low level rather than intermittently. Lagging cold pipes may prevent surface condensation, as can improved insulation levels. Find out more about the correct ways to insulate your home, and read our guide to heating your home, too.